Trying to post the Outfit Shot of All Outfit Shots you’d be amazed at the amount of nervousness I feel right now! 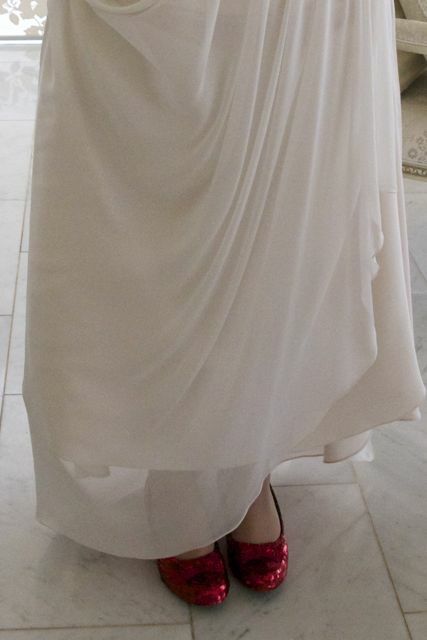 As you’d know from my “Not THAT White Dress” post I was surprised by the visceral reaction I had to a gown that didn’t look at ALL like what I’d envisaged wearing, and in the lead-up to the wedding I suffered from agonising anxiety about whether or not I’d made The Right Choice. Post-wedding I can tell you unreservedly that yes, I did. 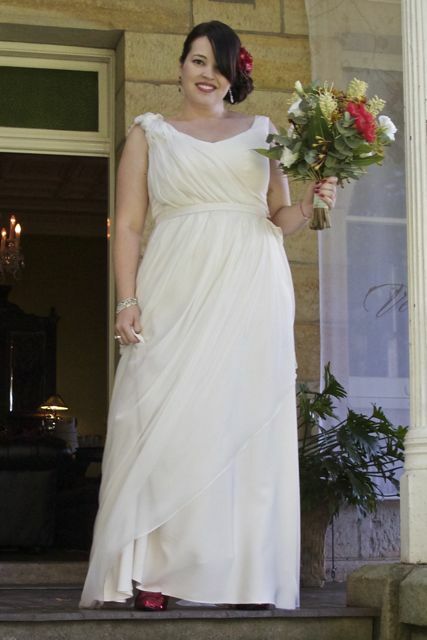 My dress was a Deco-esque Grecian-inspired silk dress with chiffon drapery, intensely soft and fluid, and an absolute pleasure to wear. Static, it was an elegant and understated work of art, but when it caught a breeze or when I walked the full circle skirt made the dress sing. The silk was cut with the matte side out so that it didn’t gleam too overwhelmingly in the warm sun of the day, and the not-quite white/ivory/blush/cream colour was my Mum’s perfect choice. Ever since I was a little girl I’ve been obsessed with The Wizard of Oz (I even wrote my honours thesis on it) so when I saw these ruby slippers, oh, years ago, I knew I’d have to have them. They were the first thing I bought for the wedding, and they were as perfect as the dress. As my bridesmaids and I walked down the aisle I heard the final bars of “Somewhere Over The Rainbow” played by my brother and his friend Sarah. My nerves melted away and I saw The Sophisticate, Matt, my husband, smiling at me from the front. He leaned in and said “look at your shoes!”. The perfect response. 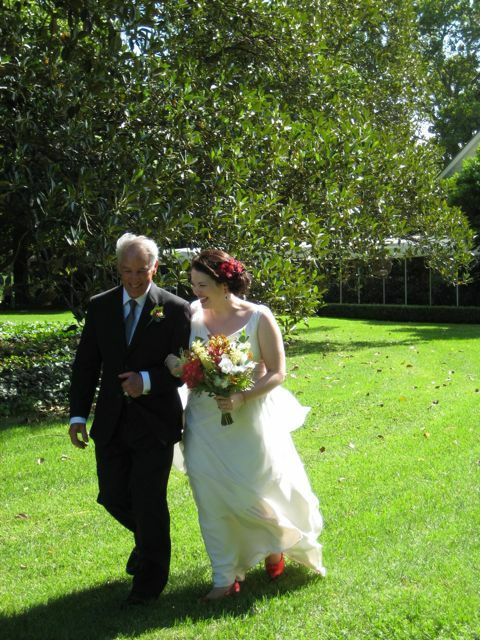 This entry was posted in How I Got Hitched, Uncategorized by lillipilli. Bookmark the permalink. a vision of beauty and happiness.. you definitely made The Right Choice! All I can say is WOW. Gorgeous. A thousand times yes! You looked gorgeous, glowing and happy on your wedding day. I love the addition of colour to your outfit, it made your look uniquely yours! The dress is simply elegant and it looks comfy-how is that possible? Congratulations to the newlyweds on what looked like a beautiful day…one more of many to follow. I wish you all the happiness in your life. You are absolutely glowing! I couldn’t picture you in any other dress but this one. It was made for you. And the shoes are to die for. Fabulous! Soooo beautiful lili . Great choice this dress. All I can say is this. Well worth the wait on the pic. You look gorgeous! And I love the dress and shoes. Congratulations on the wedding! You look breathtaking. The dress is wonderful and the shoes and corsage in your hair add such an elegant pop of colour. Glad you had such a glorious day. You look amazing Lilli! I’m very surprised by your choice but I think you look incredible. It’s funny, you never know how you’re going to feel until you actually start shopping for a wedding dress do you? My sister-in-law has chosen something I never thought she’d go for but she too looks absolutely amazing. Besutiful dress, gorgeous touches of red and a spectacularly glowing bride. Perfect. You look beautiful in every detail. Many congratulations. Lilli, you looked incredible. You’re right, that dress absolutely shines in the breeze, the PERFECT choice for an outside wedding. The touches of red, the shoes! You look like a godess. Also, the shoes! And your hair! Perfection. Oh, man, I have tears in my eyes reading this! Perfect is the only word I can think of! We can tell where you get your great taste from- your Mum! The shoes were great, and your dad looks so proud! So the next question- do we get a pic of the new husband and wife team? Oh Lilli, you looked BEAUTIFUL…ridiculous as it sounds, I teared up at the photo, silly but true. Oh, how perfect. Beautiful gown, with beautiful red accents. You look beautiful. The dress was perfect! You were a stunning bride. The dress, shoes and hair (while stunning and so you) are secondary to how happy you look. Clearly Matt is the right man for you! PS: Can we please see more wedding pics? Congratulations. You look absolutely stunning. I am in LOVE with your dress. Your entire look is gorgeous and you just look so fresh and happy! Congratulations! You look so beautiful!!! Absolutely stunning. Congratulations!!! Oh how beautiful! The dress is stunning, you look gorgeous but even more importantly you look gloriously happy! The neckline is just perfect and the flow of the dress is just … !!!! That picture of you and your dad is just so wonderful!! He looks so proud and happy! Ps love love love the ruby slippers! Congratulations on your marriage. You look so beautiful in your gown and I love the shoes and hairstyle. I hope your marriage is a long and happy one. WOW!! you chose the perfect dress! very beautiful!! Lilli, you look incredibly happy and absolutely stunning. Totally gorgeous. Your dress is divine and your shoes are perfection. Congratulations again to you & Matt! Oh my giddy aunt, you look absolutely, breathtakingly beautiful Lilli! You chose the perfect dress and you can see that you were comfortable and happy in it, a very important thing on such an occasion. I love your touch of ‘you’ with your shoes, how stunning (and bonus points to the new husband for commenting on them at the right time!). May you both have a long, happy and healthy marriage, full of happy memories to make and then enjoy. Simply stunning, what a lovely elegant dress you chose and I adore your shoes! Completely stunning! And Yes!! Those shoes! Incredible! You look beautiful – such a gorgeous dress and shoes! Oh WOW Lilli. Wow! You look AMAZING! Also the dress is so not what I expected you to wear. I was thinking 1950s tea-dress but this is just GORGEOUS! On a totally personal level – I have a real thing about strapless wedding dresses – I cannot tell you how refreshing and lovely it is to see such a beautiful different dress. Wonderful. I also LOVE those shoes! How amazing. I love how whimsical the whole wedding was – I said to a friend who also reads your blog that having seen your pictures I know I will want to get married all over again – AND I do! I’m off to put my wedding dress on and swish around the flat. I just found your blog about a week ago and have really enjoyed looking back on past posts. I just had to stop and say that you look AMAZING!!! So beautiful! I hope that the rest of your day was just as beautiful and I wish you and your new husband all the best. Perfect choice! You make such a beautiful bride. Oh wow! So fabulous :-). Can’t say whether the ruby slippers or the dress are more gorgeous. But I’m glad to hear the dress was also comfortable and the heels low and you could enjoy the day fully without the sore feet, boning incident, or gagging that wedding outfits all too often entail. You look like happiness personified, and you’re living proof that one doesn’t need to suffer to be utterly beautiful. Oh!!!!!! I too teared up when I saw these photos. You and your Dad just look so happy! An your dress is just stunning. I really like the pops of red in your hair, the bouquet, and your shoes. Like other readers I have so enjoyed watching you emerge from a long-term relationship and find your way through the hard times, and seeing you now so happy with your new husband. Thank you so much for sharing, Lily, and congratulations! Absolutely stunning. You make an amazing bride! You looked absolutely beautiful. And so happy! Your red accents were perfect, and the dress did what it was supposed to – make you look stunning. Wow! You look amazing. Pure joy works for you! My goodness, Lilli — amazing! I absolutely love the red! Your dress is phenomenal… It almost makes me wish to redo my own wedding. Just had to stop in to say you looked gorgeous! 🙂 I love it! You look absolutely lovely! Congratulations!! The dress looked absolutely beautiful on you! It’s so simply, so classic, so playful. What a wonderful choice! The shoes… what can I say about the shoes? Absolute perfection! I’ve been refreshing your site all week waiting for these photos! You look happy and radiant and comfortable and chic and a whole lot of other great adjectives! The shoes are such a personal touch, I love it! Congrats from Virginia! Lilli you looked absolutely perfect! Stunning doesn’t do you justice! As I read about your day I couldn’t help but have a tear in my eye…So romantic, so perfect, so YOU! Congratulations once again, you guys deserve all the happiness in the world! You look so beautiful! I love that you are wearing little accessories and the make up is just a bit. lovely!!! simple is always the best!!! thumb up for the shoes 🙂 next, please post a pic of you two. Check on my interview to a Plus size model on my blog! I’d love your comment! Bellissima! Wonderful…you and the dress! You look stunning. OMG the shoes. Ooooh the shoes. Seriously, congratulations! you look so happy. so insanely, life is made of candy, happy. i hope matt is the man of your dreams and married life is full of sunshine for you both. You look so happy and I love that your hubby noticed your shoes-if that doesn’t say he’s the One, then nothing does! So beautiful it brought a tear to my eye. Will we get to see any more pictures? I’m dying to see more! OOOOOOOOOHHHHHH! you look so beautiful!!! I love the shoes and hairpiece..stunning! I’ve been following your blog for quite a while now and have been inspired by the way you wear your clothes. Your wedding dress is truly beautiful, as are you in it. Many blessings for the start of a long and happy marriage. Your dress is gorgeous!! The shoes are amazing and I totally understand your love of the wizard of oz 🙂 Congratulations!!! WOW! !…..total perfection. It’s all that needs to be said. You look stunning. The dress, the accessories, the flowers-perfect. Congratulations to you both! Love, love, love your dress!!! You look gorgeous! And the shoes! My little sister is getting married in May and is also wearing ruby slippers down the aisle. I’m throwing her a Wizard of Oz themed bridal shower. I’m so happy you’re happy with your dress choice. You look so happy and absolutely stunning! ohmyfreakinggod you look so happy and gorgeous and the dress is absolutely perfect. But the shoes…. the shoes……. the shoes…….. wow! You look glorious and an inspiration. You look so beautiful and elegant. Lilli you look simply amazing, such a lovely dress for a beautiful bride. And the ruby slippers are perfection. (Love the new masthead, BTW, fab) Congrats and very best wishes. You will definitely be inspiring me next weekend when I go shopping for MY dress! All the best for you and your husband. Perfection. What makes it perfect is that you look comfortable in it. Stunning! And beautiful hair and make up- surely we can get a few more photos? But we knew it would be! Gorgeous girl, gorgeous dress! A wearer of a ruby red (tea-length) dress (with sleeves!) myself, I very much approve of your red accents. Fab, fab and fab! Wow! You look stunning. Very beautiful dress and very beautiful bride! This was delightful in every way! I’ve been following your blog for ages, and I was so looking forward to seeing this dress. Like others, it wasn’t the direction I thought you might go in, but I totally adore it. You look beautiful! Congratulations to you both from NYC. Lilli, you look radiant! Congratulations! I recently found your blog – I am in love with your style! I wish you could be my shopping buddy. Your dress is lovely, and you look beautiful in it. The ruby slippers are the perfect touch. My favorite part of this post is the last paragraph. I predict you and your husband will have a lifetime of happiness together. You look so lovely — and, more important, so very, very happy! Best wishes and years of happiness to you both! Lilli! I’ve been a long time reader and had to come out of lurking to say you look so MARVELOUS! 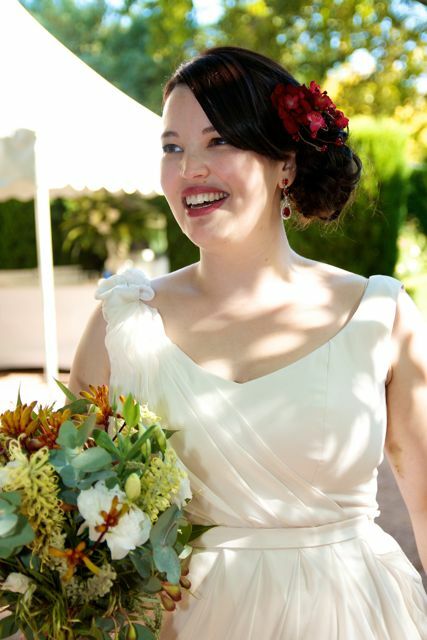 Happy, glowing and gorgeous – what a beautiful bride you make! LOVE that dress and the shoe choice is inspired, my dear. Best wishes to you and the Sophisticate! ???! You look better than amazing. I love the shoes, I love the dress, I love the hair and makeup. What a fairytale wedding! Mazal tov!!! You look so beautiful and happy and your hair is divine! I’ve been a reader for awhile and I remember when you broke up with the other guy and you were so sad and got your haircut and look at you now. You just glow. I hope you share more pictures of all the wedding details and a shot of the Sophisticate please! You look radiant….what gorgeous bride you were! And those shoes!! You do look very happy, despite me delivering you a little late to the groom. Just as well your dress coped so well to us striding out a bit. Another longtime reader delurking to say “WOW!” (and a belated congrats, too). The dress is stunning, the shoes are to die for (seriously, RED SHOEZZZZ!!!! ), and you look blissfully happy. Best wishes to you and The Sophisticate. Oh dear goodness! Just beautiful! you look like a grecian goddess! And i love the shoes they are juts perfect! Oh my, it took my breath away. Definitely the right choice !! The style is so refreshing and chic, and suits you perfectly. You look amazing and beautiful and so happy. Perfect !! Just stunning! You’re glowing with happiness. You look absolutely radiant. I always said I’d never marry in white, but you make it look pretty damn enticing. Congratulations! Whitout exaggeration: You’ve been the most beautful bride I’ve ever seen! Holey Moley my dear you look divine! Yes, yes the dress is lovely…but you in it is what makes it perfect! I love your hair, and the touches of red on your lips, earrings and the flower in your hair. Honey, I hope the day was as breathtaking as you looked. All the happiness in the world to the both of you. I’m a fan of yours here in Brazil. You were perfect, sooooo beautiful! Congratz for your wedding. You are a beautiful bride as well as the dress. I’m wishing you happily ever after. Amen. Lilli you look absolutely beautiful! The dress is so elegant and I love your hair and shoes. Stunning! You look stunning in that dress! Congratulations and best wishes! Thankyou so much, Pam. 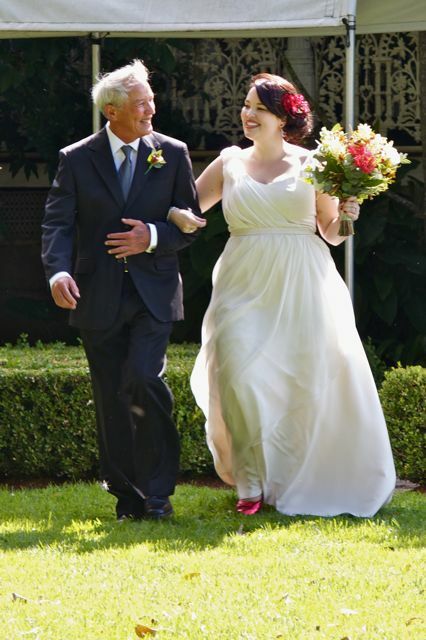 It was a really special day, and I loved the dress – I’m so glad everyone else did, too!